From the UNIVERSITY OF SOUTHAMPTON the “splode” department comes this interesting claim that tries to make CO2 the driver rather than volcanoes themselves. It looks like a big leap of speculation to me. WTFUWWUWT? Really? You can almost hear a volcanic rumble as his brain cells bounce and bump about. They don't connect with each other too often. If you listen hard, you may hear a low frequency grinding noise - could be the gears grinding. Now I haven't a clue about what was going on in Anthony's mind. 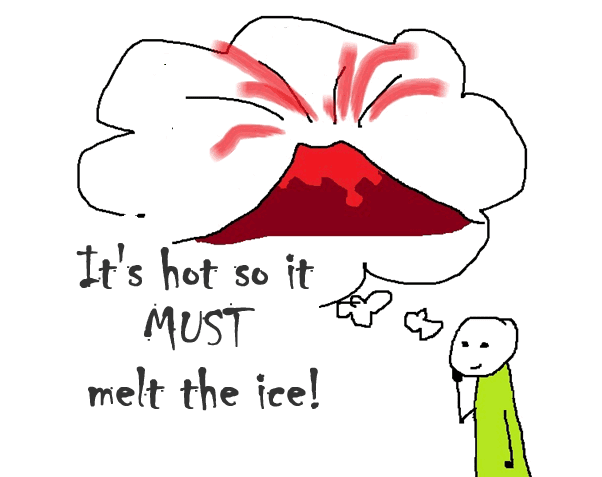 I don't know if Anthony thinks the volcanoes caused Earth to freeze or whether he thinks they caused it to unfreeze. He doesn't say. 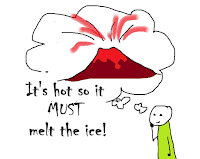 Perhaps he figures that volcanoes, without a change in CO2, caused the ice to melt. Think beds of hot rocks under the ocean :) If he thinks it must have been all the heat from those hot volcanoes that melted the snowball earth, what does he think caused the Earth to freeze to a snowball in the first place? Reverse volcanoes perhaps? Sucking the warmth out of the air only to belch it back a few million years later? Disclaimer: I'm not a research geologist or a chemist, so this is just my understanding after reading the new paper and other papers on the subject. (I can boast a prize for geology and a top in physical chem in my undergrad degree a lifetime ago, but I've since forgotten almost everything I learnt :D) I've listed some references in the text and down below, which in turn have a lot more references, if you're interested in following this up. If you see what you think is a mistake or misinterpretation, do let me know. This article covers multiple disciplines - geology, ocean chemistry, biology, climate science and more. First let's be clear. Atmospheric CO2 changes are the heart of the snowball Earth theory. The notion falls apart completely if you don't allow for the huge changes in greenhouse gases. A massive reduction in greenhouse gases (caused by long term silicate weathering) caused the temperature to drop and the surface to freeze. Each episode ended when greenhouse gases increased enough to cause the ice to melt. In 1950 Mawson identified and named a third glaciation from the relatively thin Elatina tillite, of reddish chocolate colour, and directly underlying fossiliferous ‘Cambrian’ (Sprigg, 1949–1950; i.e. Ediacaran). This has latterly assumed importance with a magnetic nearequatorial palaeolatitude (Embleton & Williams, 1986; Schmidt, Williams & Embleton, 1991). This result triggered the snowball Earth hypothesis of Kirschvink (1992) and was confirmed by further work (Schmidt & Williams, 1995; Sohl, Christie-Blick & Kent, 1999). A palaeolatitude of 7.5◦ N was uniquely accorded ‘very reliable’ status by Evans (2000). The underlying Yaltepina Formation yielded a consistent palaeolatitude of 8.4◦ N.
Since Kirschvink's work in 1992, scientists have been uncovering mounting evidence that the surface of Earth almost completely froze at least a couple of times some hundreds of millions of years ago and developing ideas on just how this occurred. The big freezes or Snowball Earth events, with ice approaching the equator, are thought to have happened during the breakup of the huge continent Rodinia during a period 800 to 550 million years ago. Think about that. I'm not just talking about events that took place hundreds of millions of years ago. I'm talking about events that took place over hundreds of millions of years (during a 350 million year span), hundreds of millions of years ago (800 to 550 million years ago). Rodinia is the name given to the "supercontinent" thought to have existed more than 750 million years ago in the Neoproterozoic Era. Before breaking up, Rodinia would have comprised most of the land on Earth in one gigantic mass. Rifting began after 750 Ma as Laurentia progressively ‘unzipped’ from Rodinia to form the paleo-Pacific Ocean. A second phase of rifting and glaciation occurs at about 610 Ma when Baltica broke away from the eastern margin of Laurentia to form the Iapetus Ocean (paleo-Atlantic). The authors of the new paper have built on this "zipper rift" idea, and are proposing a mechanism that fills in some gaps in the Snowball Earth notion. In other words, in contrast to what Anthony Watts seems to think, the authors are adding incremental ideas to an already developed idea that it was the reduction in atmospheric CO2 that caused the Earth to freeze, and an increase in CO2 that led to the unfreezing. This new paper is primarily about detailed ocean chemistry and geology, to answer some of the questions that remain. The geology part and the ocean chemistry part are inter-linked, as would be expected. 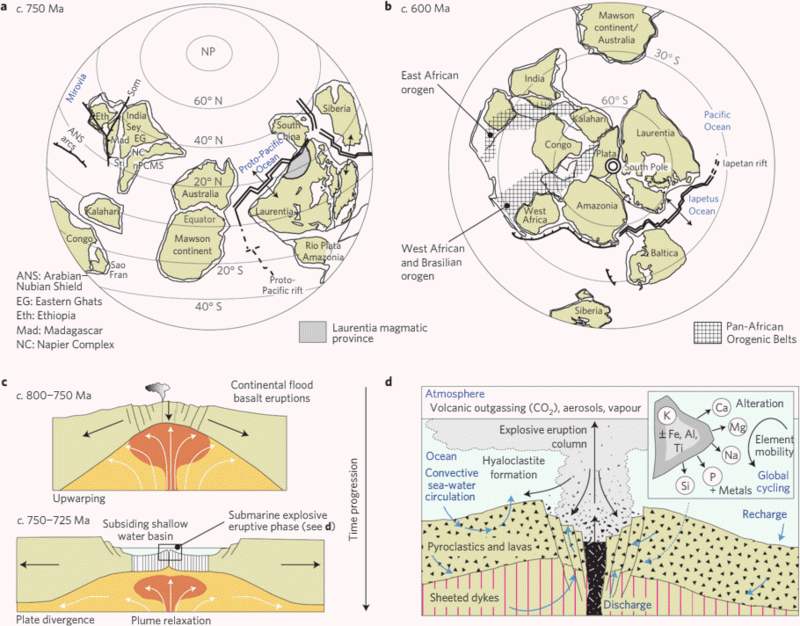 The geology is about how volcanic eruptions along shallow mid-ocean ridges (unzippering) produced an enormous amount of glassy rock called hyaloclastite. Volcanic glass is thermodynamically unstable and can be rapidly changed by hydration to palagonite, a complex substance (of varying composition). By rapidly I mean days and months. Less than the blink of an eye geologically speaking. One of the unanswered questions was about what caused the formation of thick cap carbonates. The Snowball Earth website explains cap carbonates. They are continuous layers of limestone (CaCO3) and/or dolostone (Ca0.55Mg0.45CO3), which are found overlying glacial deposits and sub-glacial erosion surfaces (where the glacial deposits are absent) from the Neoproterozoic era. Until now there had apparently been no satisfactory explanation for them. Dr Gernon explained: “We calculated that, over the course of a Snowball glaciation, this chemical build-up is sufficient to explain the thick cap carbonates formed at the end of the Snowball event." The discovery that Earth experienced near-total ice cover for prolonged periods in the Neoproterozoic has greatly enhanced understanding of Earth history, but critical aspects remain unresolved. We demonstrate how enhanced shallow marine volcanic activity, persisting for >20 Myr in the absence of most biological removal processes, would have driven major changes in ocean chemistry. high silica concentrations manifest in banded iron formations. Our hypothesis provides a critical quantitative explanation for unusually high dissolved phosphate inputs to late Proterozoic oceans. This enhanced supply may have driven the increase in primary productivity required to generate the large rise in atmospheric oxygen levels that occurred in the wake of Snowball Earth events. We infer that shallow-ridge volcanism associated with the Proto-Pacific and Lapetan rifts also prompted oxidation of the Ediacaran ocean , which would have facilitated the emergence of multicellular life. As usual, the WUWT comments ranged from the ridiculous to the supremely ridiculous, with the usual smattering of pseudo-science and paranoid conspiracy theorising. As a “driver” CO2 causes volcanoes? Wow. A new low in grasping at straws. This is what a former professor of mine would call a “SWAG”. That is a “scientific wild assed guess”. But in this case it is a bad, bad guess because CO2 does not have the magical powers those fools think it does. This is just horrible heifer dust “science”. How much time has the author spent several miles under an ice sheet to determine this? sz939 goes all Dunning-Kruger, and decides that there was "Animal Life" long before Rodinia broke up. Well, of a sort - no-one's saying otherwise. He can't have heard of the "zipper-rift" theory of Eyles Januszczak (2004). He's also under the misapprehension that the authors claimed that hyaloclastite deposits "spontaneously convert to carbonates". They didn't. That's not what they were arguing. What they were saying was that because there was near global ice cover, normal removal processes were suppressed, and that a "prolonged state of hyaloclastite eruption and alteration (with the conversion to paragonite) would supersaturate sea water with Ca2+ and Mg2+". That's what would lead to subsequent large carbonate deposits. Pardon me for raising the hand of skepticism here, but it should be noted that (1) Animal Life is well documented in the Precambrian Era, long before the time of Rodinia’s breakup; (2) One can’t have shallow marine volcanic deposits along Mid-Ocean Ridges as the ridge eruptions are by definition, the deepest ocean areas along a Mid-Ocean Ridge; (3) Dr. Gernon is a Populist Lecturer and by no means an acknowledged expert on Rodinia, Mid-Ocean Ridge Eruptions, or Subsea Volcanic Chemistry! His claims to fame involve Kimberlite Deposits, which are about as far from Mid-Ocean Ridge Eruptions as one can get. His ideas of subsea chemistry belie the facts that hyaloclastite deposits, which are by nature tufflike Glassy breccias, do not spontaneously convert to carbonates – at least so far anywhere else in the world where they form! Frankly, his claims amount to so much balderdash, that any competent volcanologist would have dismissed Dr. Gernon’s ridiculous notions as seemingly coming from some seriously deranged individual – which pretty much sums up those publishing from the University(?) of Southampton. Ellen points out to sz939 that Iceland is part of the mid-Atlantic ridge. Iceland is an above-surface portion of the mid-Atlantic ridge. The valley of Thingvellir is spreading right in time with the ocean, and there is no shortage of volcanoes erupting. I’m not sure what the definition involved may be, but Iceland certainly isn’t the deepest part of any ocean. ristvan thinks the authors are proposing biosynthesis of carbonate caps under "thick glacial ice". They aren't. They are proposing that biological activity resumes after the ice melts, not during the deep glaciation. The authors wrote: "In the glacial aftermath, conditions become more favourable for rapid precipitation: higher ocean temperatures, renewed photosynthesis. increased primary productivity. enhanced atmospheric C02 exchange and, importantly. resumption of particle settling providing carbonate condensation nuclei." Read the abstract and SI; paper is paywalled. It is all computer simulations. MonteCarlo’s, no less! And there is an apparent logic flaw. The simulations assume all this happens under thick ocean ice, which would prevent biosynthesis of the calcium carbonate caps he seeks to explain. No alternative abiological synthesis route is provided. Nor does any of this explain why snowball earth melted thanks to enhanced volcanic CO2 (the abstract’s posited mechanism) since calcium carbonate sequesters CO2 until released by heating in subduction zones. A SWAG at best. Interesting link (even though I tend to agree with Willis re: snowball earth). Prof. Lindzen wrote that temperatures at the equator have not changed by 1ºC over the past billion years, so there’s no way that a true ‘snowball earth’ has happened in that time. Poor old lectrikdog is stuck in "CO2 lags temperature" and doesn't know that it doesn't always. He or she suffers from "scientists don't know nuffin'" syndrome so common to the denialati. If CO2 always follows Temperature, then this theory could be wrong, or perhaps only misinterpreted. We know that CO2 is readily absorbed by cold seawater. In that case it has Zero atmospheric effect, but may promote Carbonate formation on seafloor sediments. The article does not specifically say that Oceanic CO2 outgassed and caused Atmospheric warming, nor does it define in terms of time and conditions what is meant by “the end of the snowball event”. It may not be so ridiculous. Oceans are shallower because a lot of water is locked up in the snowball. I think the statement above pretty much lands this squarely in the ridiculous category. “phosphorus” = “the catalyst for the origin of animal life on Earth” ?? Richard is an "all or nothing" chap who doesn't understand the first thing about climate science. His wrong comment bore little relation to the article. So, according to modern climate theory, all other factors mean nothing, not sun, not axial tilt, not volcanic activity. All climate change is because of the increase or decrease in carbon dioxide. It’s pretty amazing that, finally, an apparently complex and chaotic system is so fully understood to be neither, and that it all breaks down to one, simple, trace gas, which can be controlled easily by increasing taxes and regulating individual freedom. While poor freder wisse is cowering in fear, harbouring thoughts of deep paranoid conspiracies. Carbon is the latest demonic fashion It is used nowadays to terrify the general public and to demand sacrifices It is the modern day continuation of the inca-madness. Computer models are used as a smoke-screen obscuring reality from too inquisive minds .Good luck with this superstition . Obama does not make a mistake calling.climate change the most urgent problem nowadays except that he is using a false narrative . .
Mawson, D., 1949. "The Elatina glaciation: a third recurrence of glaciation evidenced in the Adelaide system". Trans. Geol. Soc. S. Afr. 73, 117– 121. Univ. Press, Cambridge, pp. 51– 52. (pdf here) - with a human interest article about what led to this work on the website The Snowball Earth. Hoffman, Paul F., Alan J. Kaufman, Galen P. Halverson, and Daniel P. Schrag. 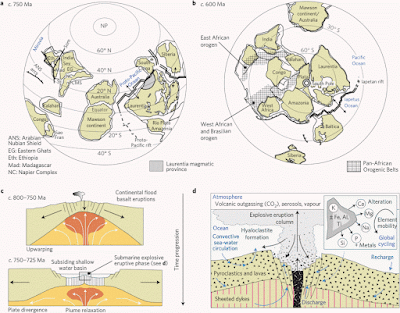 "A Neoproterozoic snowball earth." science 281, no. 5381 (1998): 1342-1346. Jakobsson, S. P. "Subglacial and submarine volcanism in Iceland." In Second International Conference on Mars Polar Science and Exploration, vol. 1, p. 85. 2000. - a paper that has some discussion about hydroclastite and its conversion to paragonite. That dbstealey comment has me wondering which days of the week WUWTers are required to believe in a global MWP. That dbstealey comment is weird. He has made the MWP disappear! If the temperature has not changed over 1 deg C for a billion years then that is truly remarkable for the constancy. And makes the recent temperature rise hugely anomalous. tbf he does say "at the equator"
but that notwithstanding they still all come across as "mad as a box of frogs"
But at WUWT they usually claim the MWP was a global phenomenon and its peak temperature exceeded our modern temperature excursion. And failing to accept that will get you labelled an alarmist stooge. Except, of course, today when dbstealey changes his beliefs to fit today's story. I like that graph. I will file it away for another day! The "anything but carbon" arguments again. Richard Alley has discussed some of these ideas. The earth can get ahead of it's homeostasis and end up with a CO2 concentration too high or too low. But not for long - events always conspire to change CO2 to the correct level, and thus reset the average temperature of the earth. Repeated snowball earth episodes indicate there was no single "correct" level of CO2 in that period. If the natural environment (which includes undersea volcanoes) were causing the rise in atmospheric CO2, then atmospheric CO2 would be rising faster than the rate of anthropogenic emissions (as both nature and mankind would be contributing to the rise). It isn't, in fact the rise is only about half the rate of anthropogenic emissions, so we know that the natural environment is opposing the rise in CO2, end of story. Of course there are other lines of evidence, but that one is so straightforward it is hard to understand how this very basic issue is so widely misunderstood. It should be easy to check - CO2 from the oceans must be saltier than CO2 from an SUV. Stands to reason. Of course, the question isn't where the atmospheric CO2 comes from, it's where the rest of what we're producing is going. Which, as scientists have determined, is mostly the oceans. Just another stuck record from the AGW denial cult. I'm rapidly losing interest. If only I could remember where and when I had the discussion, and the exact details, but IIRC someone seriously argued that it was possible that anthropogenic CO2 was rapidly taken up by plants and trees, because those emissions were primarily on land, while the actual culprit for the atmospheric increase was outgassing of the ocean. Or something to that effect. It was so weird and strange that my head started spinning. Sou writes:"... what does he think caused the Earth to freeze to a snowball in the first place? Reverse volcanoes perhaps?" Anthony is top of the pops and ahead of all of us. Obviously he read the new reports of ICE VOLCANOES ON PLUTO!!! He then put 2 + 2 together and realized he can now explain 'Snowball Earth' without any of this CO2 nonsense. >agency. "Whatever they are, they're definitely weird." If I was a climate change denier, I would stay well away from Neoproterozoic SEs. They are compelling examples of the relationship between tectonic forcing, weathering, albedo and CO2. The dance of physical climatology. Unless and until a contrarian explains - with a plausible physical mechanism - how the Earth exits an SE state *without* a huge push from CO2 forcing, SEs are toxic to GHG 'sceptics'. This is incorrect for the LGM, the Eocene Optimum, the PETM etc. And that's just the last ~55Ma. Sou, those first couple of paragraphs are sublime. I don't know if Willard has a wikipedia page, but if he does, that opening salvo is all that's needed.